Easements are a right given to another person or entity to trespass upon or use land owned by somebody else. Easements are used for roads, for example, or given to utility companies for the right to bury cables or access utility lines. Landlocked homeowners sometimes pay for an easement to cross the land of another to reach their home. The payment can be made once, annually, or at any agreed-upon schedule. Easements can also expire after a certain time period. Easements run with the land. Almost every home has an easement, generally for utility access. Look for easements in the public records, especially if a prospective buyer plans to put in a swimming pool. A property owner cannot build on top of an easement. Just because the home is described in the marketing comments in MLS as a pool-sized lot does not mean that a new buyer can install a pool. It simply means the lot is big enough to accommodate a pool. Don't let clever marketing mislead you. Easements by prescription are acquired by hostile, open, and notorious use for five years. For example, prescriptive easements could be claimed by a person who travels across a parcel of land owned by another and continuously for five years without the owner's permission or consent. If you are hoping to acquire property via adverse possession, you may also need to pay the property taxes, so consult a lawyer. 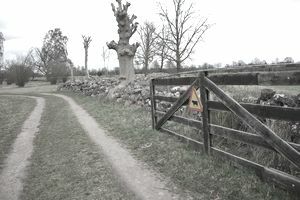 Common types of prescriptive easements generally are found in more rural settings and not in the middle of an urban environment. Home buyers don't often stop to read a title insurance preliminary report or title commitment, which lays out where the easements are located on the property. A sample easement description might say it covers the Easterly 5 feet. This would mean you cannot build a fence or install any type of permanent structure in an area that runs for 5 feet along the east side of your property line. Some easements are only referenced in the title paperwork and not drawn out on a map for you. You may need to get your hands on the assessor's map or plat map to determine where the easements are located. In addition, you should ask for the description of the easement in the legal document that is recorded by book and page in the public records. The most common types of easement found in residential neighborhoods are for public utilities. For example, if you have an electrical pole in your backyard, you might have an easement that allows a city electrical worker to trespass on your property to reach that electrical pole. That would be an access type of easement and not specifically defined. On the other hand, not every sewer line runs through the street. In older cities, it is more common to find a sewer line or cesspool in the backyard. You need to know where underground utilities, for example, are located, especially if you plan to excavate any portion of your land. In some cities, you can call a city hotline and the utility division sends out a city worker to stake your property with flags, depicting the types of utilities underground. Other types of easements could involve a shared driveway, for example, or the road could be the only access point for a home behind your property. When I shared a driveway with a neighbor in Minneapolis many years ago, the driveway was dirt. I obtained a quote to lay asphalt, and my neighbor initially did not want to share the cost. I proposed installing a fence down the center and paving only my side, and the neighbor quickly acquiesced. If you need to acquire an easement on your neighbor's land, it is easiest if you offer to pay your neighbor for the easement. Make sure you record it, though.